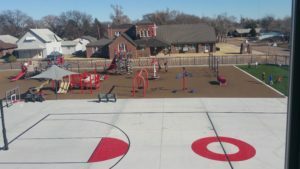 A new playground in Hoxie provides space for children and families to gather and enjoy outdoor time. It also serves the local school and area churches. Many entities came together to complete the project, including local businesses, farmers, the city, churches and the Hansen Foundation. But it was the involvement of the students that stand out with this project. Elementary students helped organize fundraisers, sold things, collected donations and spread the word about the project. Students helped sort, count, and roll of the money that was placed in jars located all over town. The students got to select the equipment and games that they wanted on their playground. Several older students even helped build the structure on the final days.